Two young men are walking 6 000kms between Kilimanjaro and Johannesburg, and will be heading towards Lusaka in the next week. Warren Handley and Tom David are undertaking this epic journey to heighten awareness about orphaned and vulnerable children as well as the importance of early childhood development (ECD) in rural communities across southern Africa. They should be in Lusaka around the 22nd June and as Zambian Eye, we shall have an exclusive interview with them. The pair are former Lonely Road Foundation interns from South Africa. The Lonely Road Foundation (now called Aluwani) was founded by Thabang Skwambane in 2007 when he completed an unsupported cycle of about 6 000km from Johannesburg to Mount Kilimanjaro in Tanzania and finished his journey by climbing the mountain. His three-month journey, the ‘Lonely Road Challenge’ was intended to symbolize the lonely road that orphans and vulnerable children walk through childhood. This was inspired by 22 month old orphan, Sello Moloto. Thabang met her in 2006 while she was waiting hungrily for food among 63 other orphans. Thabang was told that, in the reality of their situation, Sello had to learn to look after herself. It was then that Thabang realised we should live in a world where our children are looked after, and that they should never have to walk that lonely road again. 2017 is therefore the 10th anniversary of Thabang’s cycle and climb. 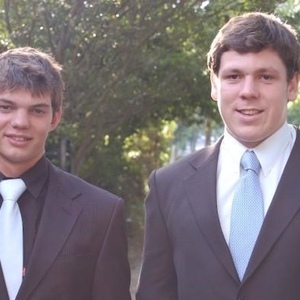 Warren and Tom saw the 10-year anniversary as an amazing opportunity to build on what Thabang did to start the organisation and highlight both the progress and new challenges that have been discovered. The pair will walk over 6 000km at an average of 50km per day. Their journey takes them through six countries, starting at the foot of Kilimanjaro in the north of Tanzania, and then walking southeast through Malawi, Zambia, Zimbabwe, Botswana and finally returning home into South Africa. They are carrying all of their equipment (backpacks, camping gear, water, food, etc. ), while living below the breadline at $2 per day. While they acknowledge they do not fully understand the hardships of poverty, this is an attempt to make the experience as relatable as possible. Born and raised in Cape Town, I went to Bishops and later UCT. I have developed a strong sense of adventure and a passion for travel, however Cape Town will always be home. With a love for South Africa comes a desire for change and social equality, resulting in a strong interest in social change. In my spare time you’re likely to find me on the mountain or in the ocean. Mondays are my favourite day. Education: Bachelor of Commerce. Majoring in Economics from University of Cape Town. I was born in Cape Town and went to Bishops and after matriculating went on to UCT. Being raised in Cape Town has allowed me to fall in love with everything that nature has to offer. In my free time I love nothing more than heading up the mountain to see a new view or tasting sea water all around the coast. I have a passion for seeing new things and especially meeting new people. Living in South Africa, I have been exposed to a lot of social injustice and that has forced me look at making active steps towards social equality not only in South Africa but the rest of the continent and even the world.